Join our temple family for an early service followed by a wonderful catered Shabbat dinner and evening. Richard Address is the keynote speaker. He is the founder of Jewish Sacred Aging. An inspirational day with a wonderful auction for women in our community. Join the Temple Emanu-El community for a morning of golf at Topgolf in Edison, NJ! ACTT community event - Speaker: Rabbi Yitzchok Fingerer; Topic: Chessed. For men and women. Join women and celebrate family milestones and unite our enegies to support those in need. Meet Jordan Gorfinkel, a cartoonist, and learn how to draw cartoons like a "superhero". Women's Circle Hamantashen Event 2019! Experience the joys of Shabbat with music and song. Program geared toward families with young children. All are welcome! All adults are invited to join us for an Adult Purim Extravaganza! Calling all Fellas and Dames to the Bees-Knees of Purim Parties! Come and help us bake our delicious Hamantashen for Purim! Come and learn with Rabbi Rosin and your fellow congregants! 100% of net proceeds will benefit Yashar LaChayal - Straight To The Soldier. Games, food, fun! All are welcome. The concert From Broadway to Bimah is a fundraiser for the Highland Park Food Pantry. Join us for a great evening of fun and food! Afternoon of Spirited Music with Avi Wisnia and Nosh a Hammentashen! DATE: TUESDAY, MARCH 19, 2019 TIME: 1:15 PM COST: $8/JCCMC Member; $11/ Non-member Sorry, No Refunds! Come for Purim Dinner and stay for the Magic Show! MJC FAMILY PROGRAM AND MEGILLAH READING! Celebrate Purim with your Neve family! Come and Join us for the Megillah Reading for Purim - wear your best costumes for a great and fun-filled party! 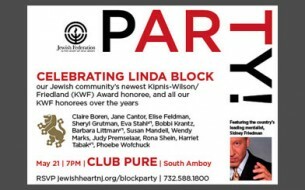 Celebrate a royal Purim Feast with CJL! Megillah Reading, Festive Banquet, Costumer Masquerade, Magic Show and more! Celebrate Purim with Temple Emanu-El! Join us for a Purim Service followed by a "Pirate Purim Shpeil". All are welcome! Come and read the entire Scroll of Esther. Shacharis followed by Megillah reading. Azzan Yadin-Israel, Rutgers University Professor of Jewish Studies, presents THE BOSS AND THE BIBLE. Enjoy lunch, inflatables, games and Purim arts and crafts. Ahavas Chesed - Loving kindness 5 booster event. Speaker: Rabbi Fingerer. For men and women. Join us for Shabbat Dinner, followed by our Shabbat Service. All are welcome! Deborah Lipstadt will be at Neve Shalom! You Say "Passover" and I say "Pesach"